Alexandria, VA - The Alexandria Convention & Visitors Association celebrated the economic impact of tourism and the accomplishments of the ACVA over the last five years at their annual Summer Social on June 15, 2012. In five years, visitor spending jumped nearly 17% in a period when visitor spending increased an average of 7% in Virginia, dramatically outpacing regional neighborhoods. The annual event also served as a farewell to ACVA&apos;s President & CEO Stephanie Pace Brown who, after serving as Alexandria&apos;s top tourism official since 2007, is departing to head the Asheville Convention and Visitors Bureau in Asheville, North Carolina. As city council&apos;s representative on the ACVA board, Councilman Paul Smedberg praised the organization&apos;s accomplishments under Brown&apos;s leadership and the positive impact on visitor spending in the city. ACVA launched a strategic new consumer brand for the city, "Shop, Dine & Celebrate on America&apos;s Historic Main Streets"; crafted an advertising strategy that reaches 100 million households; launched and relaunched VisitAlexandriaVA.com which is on pace to reach 1 million views within the year; and in February the sales team - led by Vice President of Sales Lorraine Lloyd, who will be serving as the interim CEO - announced that they had booked $1 million in business for Alexandria in one month. 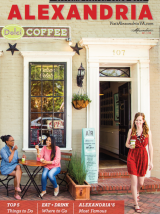 A return-on-investment study of destination advertising placed by the ACVA found that for each dollar spent, the return on investment was $133 in visitor spending and $4 in city tax revenue. As a result, in the 2013 budget, city council awarded the ACVA with an increase of $100,000 for advertising. The program included remarks from Deputy City Manager Mark Jinks as well as current ACVA board chair Jody Manor and former board chair Charlotte Hall. The event was sponsored by the Alexandria Hotel Association and hosted by the Potomac Riverboat Company aboard the Cherry Blossom.